SubRosa - a community space: Thurs. @ 4:30pm- pot-luck & conversation re: case of death row prisoner Bomani Shakur and more! Thurs. @ 4:30pm- pot-luck & conversation re: case of death row prisoner Bomani Shakur and more! hey friends! a reminder about this event tomorrow...note the new time! gather at 4:30pm! 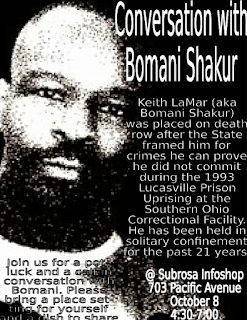 Bomani Shakur (aka Keith LaMar), was framed for murder in retaliation for his role in organizing a resolution to the "Lucasville Uprising", a 1993 prison rebellion. He was sentenced to be murdered by the state of Ohio. Last month he lost his final appeal. The government deliberately withheld evidence in Bomani's case, including another inmates confession to the crime Bomani was convicted for. Food and conversation will start promptly at 4:30pm so that we can join in the call with Bomani in a timely fashion.